5 Ways Wall Murals Tell the Story of Your Company. 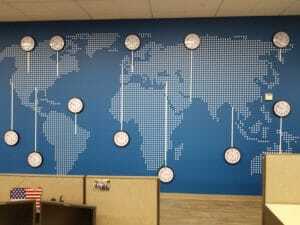 One of the most popular ways to tell a story with a wall mural is by creating a timeline. These visual timelines are powerful reminders of an organization’s milestones. Dimension and interest are created by using dimensional graphics layered on a background mural. There are a myriad of materials and hardware available to perfectly create the look and feel of your story. 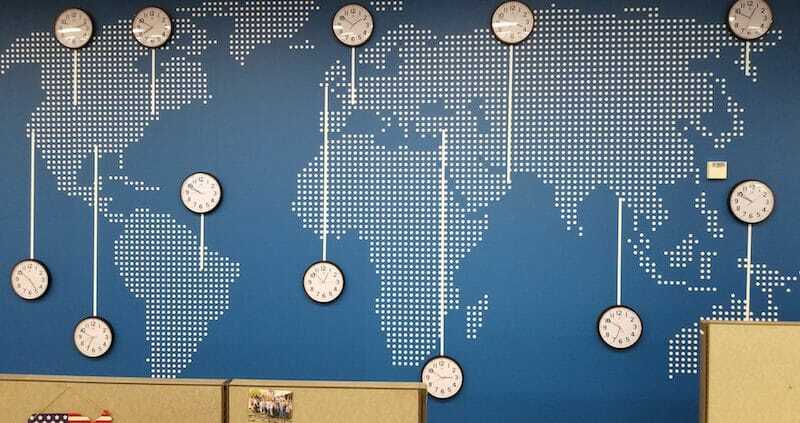 When planning a timeline mural, look throughout your history and find the moments that changed your company’s trajectory. This could start with the inception of your company then followed by the showcase of a new product innovations or expansions into new markets or even financial milestones that were transformative. The timeline should equally inspire your internal stakeholders and impress the external ones. You are awesome. 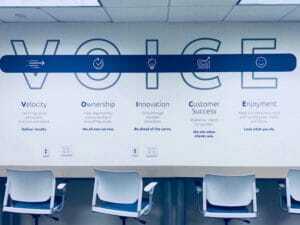 You deliver a great product or service to your clients so feel free to brag about it with a wall mural that narrates what you do. 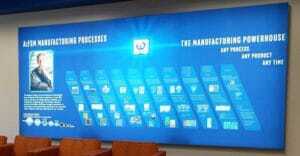 Whether it is explaining the components of your product or the process of your manufacturing, a wall mural can tell the story. 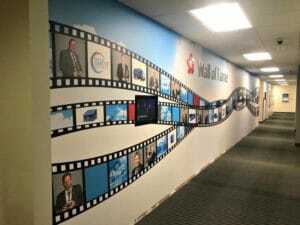 Companies often forget how cool they really are and an impressive wall mural is just the reminder they need. We all know that while companies have outstanding products and services, it is the talent of the team that makes an organization truly great. Why not take some wall space and show your team how much you appreciate them. You can make a Hall of Fame wall featuring employees that made extraordinary contributions throughout your history. 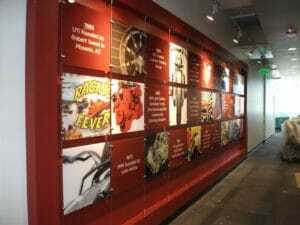 Or scatter wall murals throughout the halls of your company and highlight the heroes of your organization. 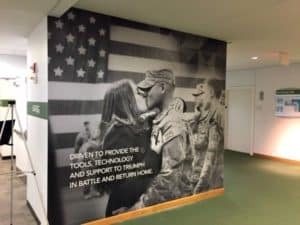 Wall murals that spotlight team members increases morale and creates an environment that shows you appreciate their efforts. Organizations spend a considerable amount of time, resources and effort to develop the core principles that will steer them. Often these are shared once at a big state of the company address, then logged away in the company handbook. Instead, find a prominent wall that is visible daily to everyone and showcase your vision statement. Or you can sprinkle bits and pieces of your core values one wall at a time in every department. EGD is all about using design to promote the business strategies of your organization. It is widely accepted in modern management philosophies that culture is one of the most important elements to an organization’s success. 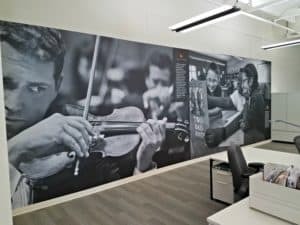 Using wall murals to present the expression of your company’s culture can be as valuable as showing the mission statement. Whether you foster volunteerism, compete in a Spartan Race together or simply live by the work hard- play hard mantra, wall murals are an excellent way to bring your team together. Study after study shows that a great culture is as important as a great paycheck to today’s top talent. So go ahead and brag about whatever makes your company unique and special. There are many other applications for a wall mural to tell a story, these are just a few. All it takes to make a great work space is to think about what makes your organization great and different and then have some fun! You can visit this page for inspiration of some great wall murals.